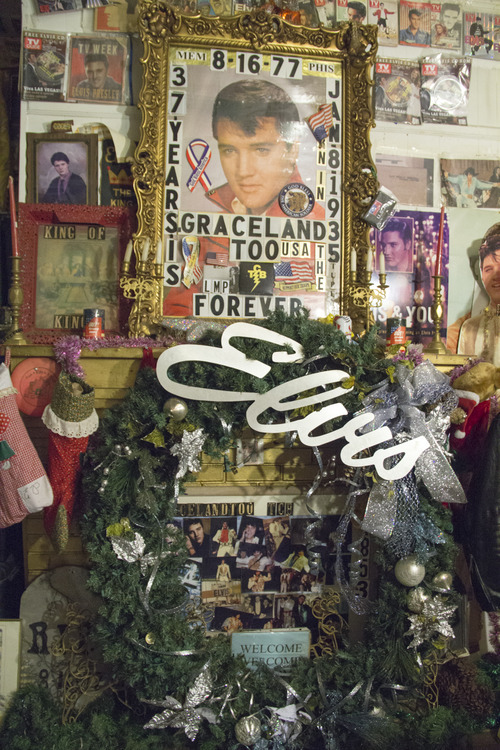 Paul MacLeod, owner of Graceland Too, in Holly Springs, Mississippi, was the world’s most passionate Elvis fan. He owned and operated Graceland Too, a museum people could tour of his vast Elvis memorabilia since the early 90s. Paul was a fascinating character and when news came of his passing many people (young and old) grieved his loss. As theClarion Ledger reported, Paul had an unfortunate altercation at his home July 15th in which he killed a trespasser. Days later Paul was found dead at his home. Nothing has been confirmed about his death, but it’s believed that he passed from natural causes. 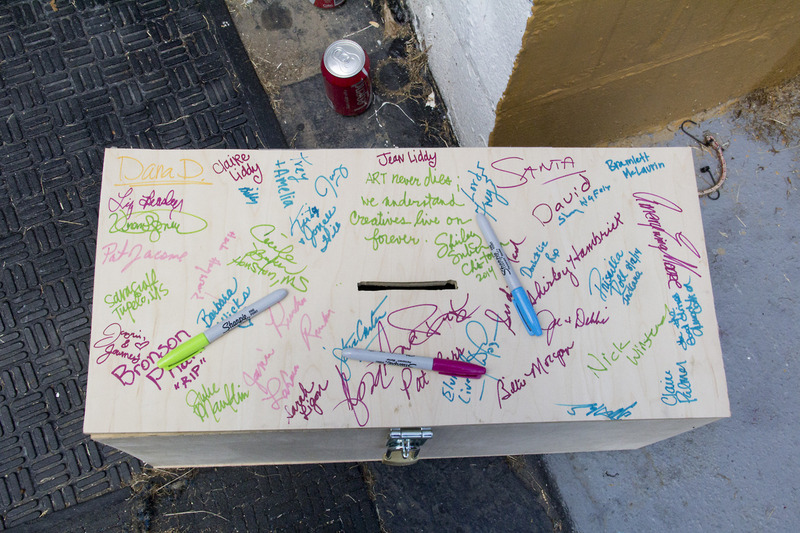 On August 12th, an all day memorial was held for Paul and his Graceland Too residence. People came from all over the country to honor Paul and help pay for his funeral expenses. There were dozens of volunteers, friends, and family that gave tours and told stories of the beloved Paul. I had been to Graceland Too five times before. But when I entered his home this time around, it was completely different. I still expected to be greeted by Paul and see his lopsided dentures flopping around in his mouth. I imagined him shouting excitedly at me. “YO YO YO!! !” he used to yell when telling his Elvis stories. He’d jab my arm in the way your mom used to when you weren’t paying attention. That certainly got my attention the first visit (even though there was no way NOT to pay attention). I marveled at his enthusiasm and his expertise in Elvis knowledge (however accurate it might have been). After being at Graceland Too about five minutes, one would realize it wasn’t at all about Elvis anymore. Mary Hinds, a friend of Paul’s, was starting out the tour and as I caught up with the group I heard her explain Graceland Too as an art installation in which Paul was the main event. “They should pick up this entire house and put it in the Smithsonian,” Mary said. 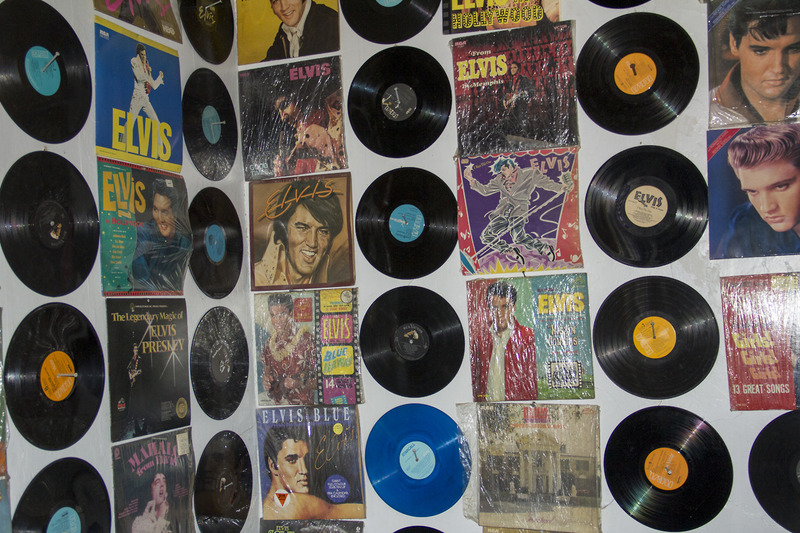 There are many items in Pauls house that only someone who actually knew Elvis would know. 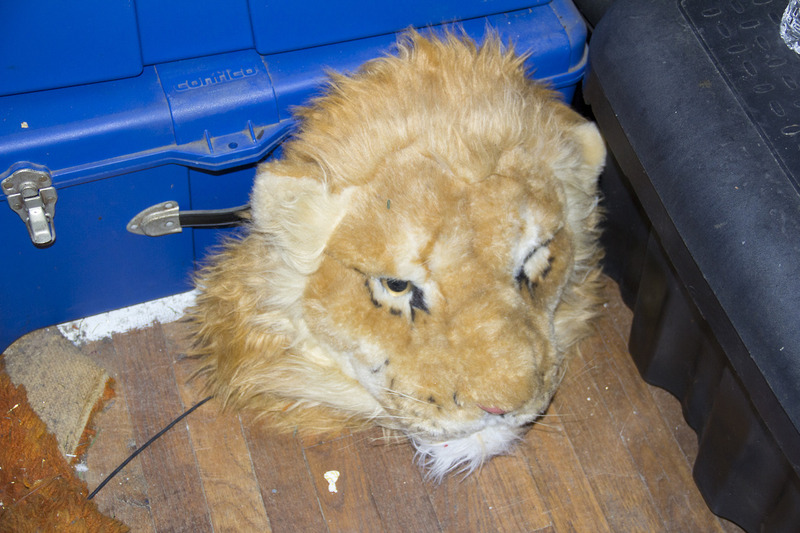 The Tiger head in the living room (where Paul would sleep) was important to Paul because Elvis’s boxing nickname was Tiger. Didn’t know Elvis was a boxer? Yeah, me either. 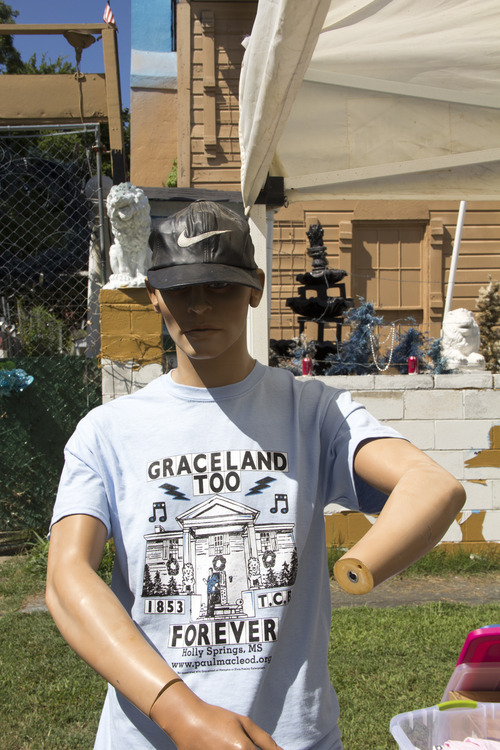 Graceland Too is littered with knick knacks like this—each monumentally important to Paul because of some personal relationship to Elvis (even if the relationship was only in Paul’s mind). As I passed through the house avoiding the guided tour, I found myself near his refrigerator and without anyone noticing me I opened it. It was important to me to know what such an interesting man kept in there. Pizza, water, butter, and beer. Nice. Not only was Paul crazy for Elvis, but he also loved his Graceland Too Lifetime Members (after you go three times, it’s free forever). 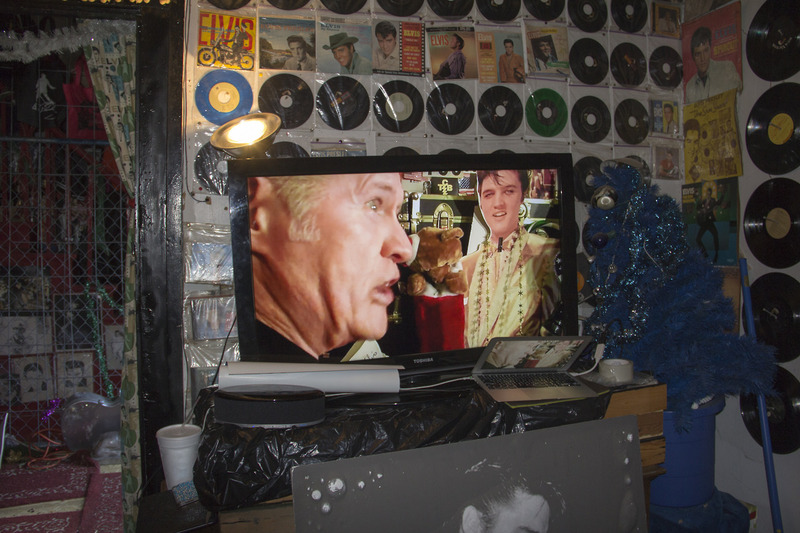 He would take your photo in front of the Elvis shrine with a leather jacket and pink guitar—all with a disposable camera and print the images to hang on his wall. 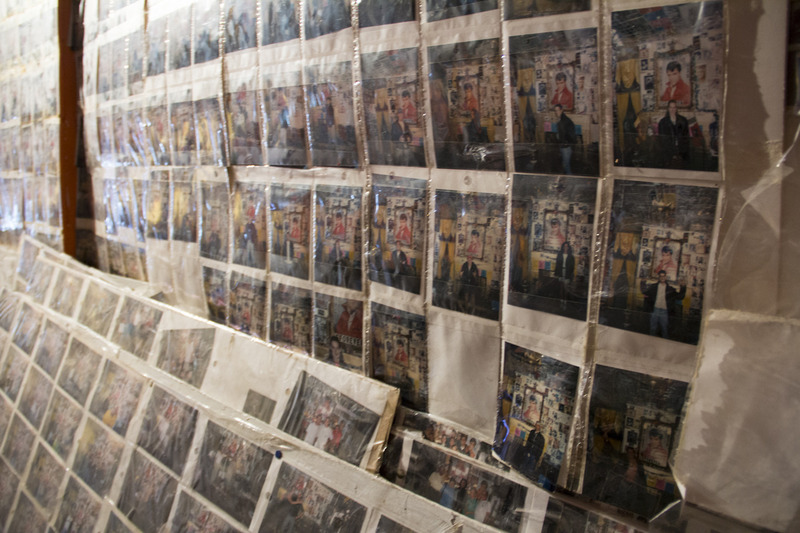 He always printed doubles and when members came he would find their photo and give them a copy. 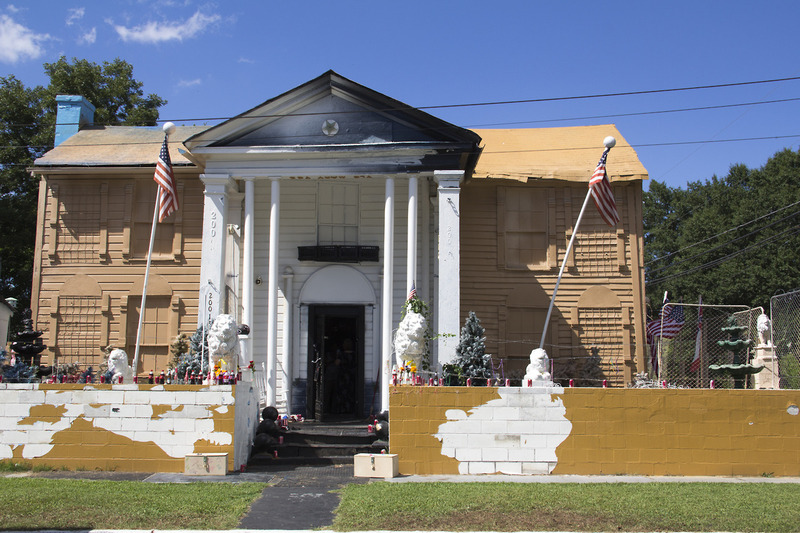 It’s uncertain what the future of Graceland Too will be. I spoke with one of his daughters who I approached because of her striking resemblance to Paul. She mentioned her sadness at learning about all the events over the internet. “We have to get the estate out of debt and my sister and I have to take care of all of that,” Sherry said. She said they will have to start selling stuff out of the museum if need be and that will likely upset people. “You can’t have a basket full of eggs and not break one,” she said. My last stop in the house was the record room where Paul would sing to his visitors. It was everyone’s favorite room in the house. A video of Paul entertaining guests and singing was playing and I laughed with the volunteer about how charismatic Paul was. Soon after, his other daughter, Brenda, joined us and we shared some stories about where Paul liked to eat in town. “Not many people can google their father and see dozens of photos, videos, and stories,” Brenda said. It’s hard to explain how unique of a collector Paul MacLeod was. If he had been a boxer, he would have been Muhammad Ali. If he had been an outlaw, he would have been Jesse James. If he had been a musician, he would have BEEN Elvis. But he was a master collection artist who had a true passion for Elvis Aaron Presley and at least we have that. 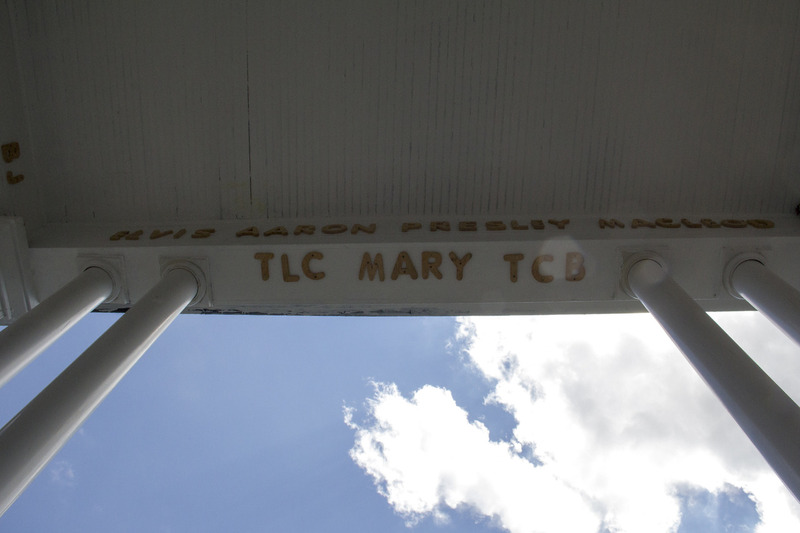 Editor’s note: Read and see Tennessee State Guide Lindsay Scott’s original dispatch — WHERE ELVIS NEVER SLEEPS — for more on the life and times of Paul MacLeod and Graceland Too.